This recipe was the inspiration for my post on using beans as a thickener. It’s a fairly standard pan sauce but adding lots of vegetables so the sauce does double duty as a side dish. 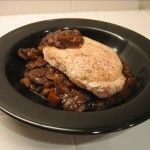 My wife loves one-dish-meals and this gets pretty close, especially if you eat it like she does- chop up the pork chop and mix with the sauce in a bowl. I buy whole pork loins and then cut into roast-sized pieces and freeze. I either roast them whole or slice about 3/4″ thick into pork chops. Either way, it’s cheaper to buy the whole loin and cut yourself. I usually get them from Costco. Heat a stainless steel skillet to medium heat. Add olive oil. Season pork chops with salt and pepper and add to pan. Saute over medium heat until just done. I cook them to medium. When finished, the pan should have a light brown glazing with bits stuck here and there. That’s good! Now add the bacon and fry until crisp. This should add to the brown bits stuck in the pan. That’s even better! This is where a ton of the flavor comes from. 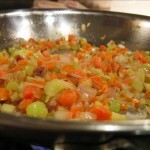 Now add the carrots, celery and onions and saute about 15 min or until tender. 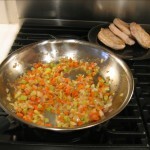 At first, the vegetables should release some liquid which dissolves some of the pan bits. 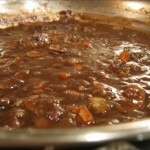 After the liquid dissolves the vegetables will start browning some and letting the pan collect brown bits again. Add the mushrooms and cook another 5 min. Once our vegetables are tender and the pan is nicely brown again, it’s time to deglaze. Add the red wine and thyme. The color will be purple at first. We want to cook this until it reduces by at least half and the color starts turning more brown than purple. Then add the chicken stock, beans and kitchen bouquet. The sauce should pick up a nice body and color. Cook with the lid off until it reaches the desired consistency. If it gets too thick you can add some more chicken stock or water. If it’s too thin, keep cooking. The sauce should be velvety and a beautiful brown when finished. 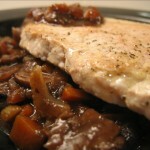 Spoon sauce onto a plate and place a pork chop on top. NOW GO EAT! As usual this recipe is based on the ingredients I happened to have on hand. The exact proportions of ingredients aren’t that important. The most important aspects are good quality ingredients and proper cooking technique. This explains why a good chef can turn nearly any combination of ingredients into something absolutely delicious. Use these suggestions to make this recipe your own! If you come up with a good variation, post a comment to let us know! YUM! I have no idea why, but I always forget about adding bell peppers to things like this. I bet that was good! I only seem to remember them for Cajun-style recipes. I just picked up a bag of herbs de provence from Penzey’s and I think the combination of herbs and lavender would go really well in this. I can’t wait to try that.